Between 2011 and 2013, the U.S. Food and Drug Administration approved a miserly three antibiotics, the lowest rate since the first antibiotic was discovered in the 1940s. This stagnant development of antibiotics has made combatting antibiotic-resistant bacteria, known as “superbugs,” a real challenge. Fortunately, President Obama pledged $30 million annually from 2014 to 2019 for superbug research, detection, and outbreak-control. In the past year, these drug-resistant superbugs accounted for nearly 150,000 hospitalizations and 23,000 deaths in the U.S. alone, making the need for antibiotics targeting superbugs ever more dire. While some blame the sluggish pace of superdrug development on low profit, many in the biological world point to the relative dearth of knowledge about the molecular mechanism of antibiotics. The long-held view has been that antibiotics target bacteria with specificity and precision—the “one drug, one target” motto. In September 2007, microbiologists heard news of a conflicting theory. Led by Professor James Collins, a team of researchers at Boston University published groundbreaking work in Cell suggesting that antibiotics attack bacteria by creating biochemical chaos. Today, the mechanism of action of antibiotics is under debate within the scientific community, as researchers and medical professionals probe for answers. 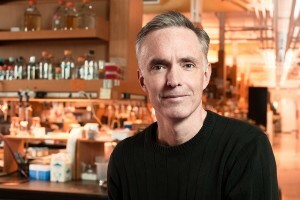 James Collins is often considered one of the cofounders of the field of synthetic biology. He is also outspoken in the ongoing debate about antibiotic mechanisms. Courtesy of Science News. Before Collins, scientists believed that antibiotics strike by attacking one of three main targets—the bacterial cell wall, ribosome, or DNA. These antibiotics were calculated killers, targeting crucial aspects of bacterial survival. But as many bacteria become resistant to our current database of antibiotics, researchers wonder if there may be drugs that work differently. Depending on the mechanism of action of antibiotics, researchers could adopt different approaches to developing superdrugs to combat menacing superbugs. The Collins lab showed that regardless of antibiotic class or target, bactericidal antibiotics—those that induce bacterial cell death, including ampicillin and kanamycin—stimulate the synthesis of death-inducing hydroxyl radicals by the bacterial cells themselves. Under this model, antibiotics push bacterial cells out of their steady state into biochemical chaos. Collins suggests that all three known classes of antibiotics rev up the bacterial cell’s metabolism as a defense to the initial antibacterial attack. This leads to the buildup of toxic cellular waste. More specifically, the metabolic boost of bacterial cells in response to antibiotic exposure creates a radical oxygen species, known as superoxide, that can release iron from inaccessible clusters. The unleashed iron is then free to react with hydrogen peroxide—another metabolic product of the bacterial cell’s response to antibiotic—resulting in radical hydroxyl species that wreak havoc on the bacterial cell. A schematic of the Collins model wherein antibiotic insult to the bacterial cell leads to a metabolic boost, producing an oxygen species that releasese iron from iron-sulfur clusters. Collins proposes that these are the initial steps in bacterial killing. Courtesy of Jonathan Kannair. Yet a slew of criticism against the Collins model ensued. Three papers published in Science in the following years attacked Collins’ theory and approach. In fact, a group at the University of Illinois at Urbana-Champaign repeated the same experiments, but observed bacterial death in an oxygen-free environment, in stark contrast to Collins’ research. However, there is also an accumulating body of empirical evidence in support of the Collins model. The Walker group at MIT found that the antibiotic-induced hydroxyl species damages the bacteria’s own guanine bases in the DNA, and the Rubin lab at the University of Pennsylvania found that clofazimine, an antibiotic used to fight drug-resistant TB, depends on the radical oxygen species to achieve its lethal effect. Both of these findings strongly support the Collins model. Enbiotix, cofounded by James Collins, is centered on the idea that antibiotics kill cells by producing radical oxygen species. The company plans to use the Collins model in making current antibiotics into more potent killers. Courtesy of Lab Central. The unresolved controversy has further contributed to the stasis surrounding the antibiotic drugs pipeline for drug-resistant microbes. Researchers are left to decide where they fall between the conventional and Collins schools of thought. While the verdict is still out, Collins has wasted no time debating, making it clear that he believes in his suggested mechanism of action for antibiotics. With his business partner, Jeff Wager, he cofounded a Boston-based company called EnBiotix in 2012. EnBiotix attempts to commercialize the work of the Collins lab by developing superdrugs or antibiotic “adjuvants” that resensitize superbugs to traditional antibiotic therapies. Given that superbugs are on the rise, the need for new antibiotics is absolutely critical. Similarly, the necessity for a definitive answer on how antibiotics kill bacteria could not be more pertinent. The initial progress inspired by the Collins model has been hindered by dubious findings from other groups and has led to a slowdown in the development of novel superdrugs. While some, like Wager, remain “unshaken” by the results of these conflicting groups, others, like the World Health Organization, are counting on the scientific community to put this mystery to rest. Otherwise, it will only be a matter of time before superbugs can no longer be tamed. Cover image: A scanning electron micrograph of superbug methicillin-resistant Staphylococcus aureus (MRSA) in yellow, surrounded by an ineffective type of bacteria-killing white blood cell known as a neutrophil, in red. Courtesy of Wikimedia Commons.